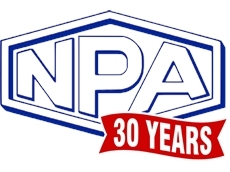 Established in 1986, NPA Pty Ltd is Australasia's leading wholesaler, manufacturer and supplier of Cabling and Wiring Accessories, Electronic Hardware and Nylon Fasteners. We stock thousands of lines of products that can be delivered to you by the next working day. Australian owned and operated - Products are distributed throughout Australia, New Zealand, Asia and South Africa from a modern warehouse based in Adelaide, South Australia. 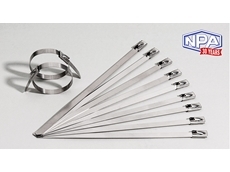 Guaranteed quality and certification - NPA has worked hard to build a reputation as a supplier of products with outstanding quality, backed by industry certifications that you can rely on. In 1997 the company successfully implemented a formal quality system ISO9001, 2015, accredited by SAI Global. World-leading brands IN STOCK NOW – Get your parts FAST. Apart from its own range of Cable Management, Termination, Fasteners, Plugs, Bushings and Spacers, NPA is also the authorised Australian distributor of leading international brands such as Heyco, Keystone and Micro Plastics Inc. We have thousands of product lines in stock and can ship to most locations in Australia by the next business day. Old-fashioned customer service by professionals - Call NPA today to have our expert and friendly sales team help you to find the perfect components at the right price for your next project. NPA range of solar products includes Heyco Solar Power Components. Heyco is a well-recognised leader in the design and manufacture of wire management products for the solar industry. With up to 20 years warranty on some critical solar parts - order today and your parts will still be covered in 2039! Call us now to request our full Solar Components Catalogue.MARINE GRADE STAINLESS STEEL CABLE TIES – SELF LOCKINGTough and resilient to extremes of temperature and hostile environments. Manufactured to a stringent quality standards. Self-locking head design. Extremely competitive pricing for bulk purchases. SOLAR POWER COMPONENTS LABKIT #9LabKits are perfect for product design departments, experimental labs, and for all prototype work.The Heyco Solar Power Components LabKit #9 contains an assortment of the most popular Solar Panel Connectors, Cordgrips, Clips and other accessories.Parts in LabKits are available in various sizes and colours. 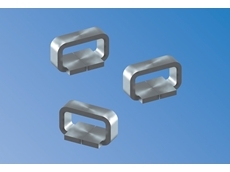 Please consult us for further information.STAINLESS STEEL CABLE CLIPS SunRunner Clips to suit ever type of cable module, panel, frame, rail and rail-less system. 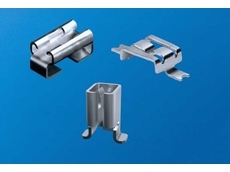 Clips have rounded smooth edges and a selection of vinyl coated clamps and clips are available. CABLE GLANDSSecurely attach cables to an enclosure with Liguid Tight Cordgrips. Suitable for Enphase Q and SolarEdge cables. Multiple cables per cordgrip. Utilises skinned-over technology so that unused holes retain a liquid tight seal. 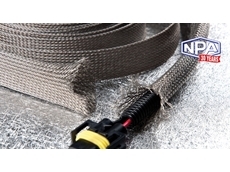 Expandable sleeving from NPA to suit a variety of applications and conditions. Some of it can really take the heat! See details below.COPPER FOIL SLEEVING (EMI SHIELDING)This copper foil shielded sleeving is woven with a copper foil monofilament and is used in different electrical and industrial fields where EMI shielding is required. The copper foil sleeving provides excellent protection and features lightweight properties. It is lighter and more flexible than tinned copper braided sleeving, making it a great combination of economy and durability.Applications: The copper foil shielded sleeving is used in communication systems, electronic medical equipment, and military equipment.POLYESTER EXPANDABLE SLEEVING (FLAME-RETARDANT)This polyester expandable braided sleeving is flame-retardant and halogen-free. It offers durable abrasion resistance in a wide range of industrial applications.The open weave construction allows an easy installation on a bundle of hoses and cables, even if some with bulky or large connectors. A totally expanded sleeving can reach 1.5 times than the initial dimension. It can operate at a temperature of -50? to +150? with a melting point from 240±10?. The unit meets the standards of UL, ROHS, PFOS, and REACH. Applications: It is used for covering cables, wire harnesses, tubes, industrial hoses where they require additional protection.PPS STANDARD BRAIDED EXPANDABLE SLEEVING (HIGH TEMP)The PPS expandable braided sleeving is made from Polyphenylene Sulfide (PPS) monofilament UL94 V-0. It is commonly used in high temperature environments and is known for its resistance to chemicals and abrasion, high temperature stability, low moisture absorption, and excellent dimensional stability.Applications: It is commonly used in the automotive, railway, aerospace, telecom and military industries where high flame and temperature resistance are required.SELF CLOSING BRAIDED WRAPSelf-closing braided wrap offers an innovative solution to the protection of breakout areas and also provides ease of removal when inspection or maintenance of cables is required. The special open structure allows it to be installed after other components, for example copper terminals and connectors.It provides excellent abrasion and flame resistance.Applications: Wire harness, automatic equipment, railways, general manufacturing industry where wires and tubes need a tough and durable protection.VELCRO BRAIDED WRAPOur Velcro Braided Wrap helps keep an environment clean and organized by bundling cords and cables together. It can be easily wrapped over the cables, and re-opening is quick and easy for cable addition or removal. Breakouts can be created simply by drawing the cable through the Velcro.Applications: Velcro braided wrap is widely used for the management of A/V cables and power cords in home theatres, computers, TV stands and other common cord applications. Highly Durable - Our gels are highly resistant to ozone, UV Rays and chemicals, making them ideal for a large range of diverse applications.Consistent Performance - Even in extreme conditions (-40°C to 200°C) the gels provide stable performance. Safe - the gels are non-toxic, non-allergenic and emit no harmful gasses when burned.VIBRATION DAMPENERSExcellent vibration dampening qualities for loads 2Kg - 300KgIdeal for low frequency and micro vibration due to resonance point designed to be set low.There are many types of vibration dampeners to choose from including:Type BGSupported by a spring, type BG is effective for vertical vibration damping.Type SFFor applications where a bottom plate is preferred instead of a bolt.Type SF (Rubber Coated)For applications where a bottom plate is preferable and there is a need for damping heavy-load vibration. Good for outdoor use due to reinforced durability deriving from Gel wrapped by bellows-type EPDM rubber. 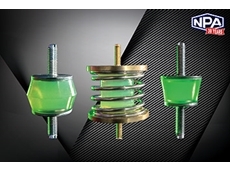 Stable performance in the -20°C to 90°C range.GEL BUSHINGSDesigned to damp tiny-to-light-load and micro vibration. Effective for minimizing horizontal drift, using a bolt running through Gel Bush. Along with its shock absorbing capability, Gel Bush is ideal for light and fragile objects including PCBs (printed circuit boards). Available for loads from 0.2 kg to 32 kg with 4 points of support.SN SHEETSAdd more or divide SN Sheet flexibly for a wide range of load requirements. Just place it under the device. Removable anytime. Stable with small resonance magnification and little horizontal distortion.GEL TAPE AND CHIPSSimple and easy solution for vibration isolation and shock absorption with adhesive on one side. Wide selection to choose from based on width and thickness. Very easy and effective solution for shock absorption and vibration damping where no space is allowed for insulators or bushes. Wide temperature range from -40°C to 100°C.NP GELLightweight and highly durable foamed type. With low compression set, performance of NP Gel is maintained even after repeated compression. Highly flame retardant and operable in the -40°C to 200°C range. Good for outdoor use because it is highly resistant to weather and ozone.GEL SHEETS AND PASTEGel Sheets are used for thermal conductivity, electromagnetic absorption and electric insulation. Soft, sticky and conformable, Gel Sheets often exhibit performance much better than expected due to close contact. Gel Sheets and Paste adhere to rough surfaces where it’s possible to eliminate air gaps.The range of gel products that are available is extensive. If you are interested in trying any of our new gel products, please don't hesitate to contact us for detailed specifications and to explore the best gel to suit your application. 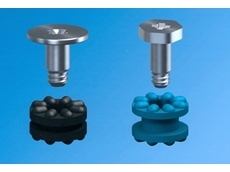 20/05/13 - Keystone Electronics Corp presents a newly developed series of anti-vibration grommets specifically engineered for electrical insulation, mechanical damping and noise suppression in office or lab equipment. Keystone’s anti-vibration grommets are engineered to isolate sensitive instrumentation from unpredictable vibration and shock, using ‘fingers’ that flex as needed to dampen unwanted noise or vibration. Special shoulder screws provide correct spacing, allowing the screws to be fully tightened down. Keystone’s insulation anti-vibration grommets are designed to accommodate panels from 0.031" to 0.125" thick, and manufactured from durable EPDM rubber in black or blue colour. The custom fitted shoulder screws are made of nickel plated steel in 6-32 and M3 threads. Supplied as unassembled sets (insulator and screw), the grommets are available from stock through Keystone's global distribution network Keystone Electronics Corp. is a major manufacturer of interconnect components and hardware, providing a full complement of stamping, machining and assembling services. An in-house application engineering group focuses on product modifications or customised designs. Headquartered in the USA with offices in Canada, Europe, Australia and Asia, Keystone is ISO-9001:2008 certified and RoHS, REACH compliant. 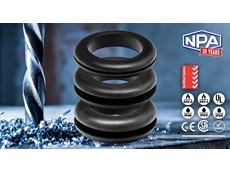 Keystone products are available from NPA. 25/01/13 - NPA introduces a new miniature SMT test point recently added by Keystone Electronics Corp. to their test point range. Featuring symmetrical flat-wire design to efficiently and safely test PCBs, the latest ‘mini-pad’ version enables high-strength, test point-to-PCB bonding with a minimal footprint. The new Keystone miniature SMT test points not only enable cost savings, but also accept a variety of gripping probes to replace wire-wrap posts and turret terminals, thanks to their low profile design. These test points are ideal for testing circuitry of high density PCB packages. Manufactured from phosphor bronze and silver plate, which can accommodate the use of both lead-free solder and traditional reflow processing, the miniature SMT test points are packed on tape and reel and available in 1,000- or 5000-piece reels. All are compatible with most vacuum and mechanical pick-and-place assembly systems. Keystone is a major manufacturer of interconnect components and electronic hardware. 02/12/11 - Keystone Electronics Corp. presents a broad range of surface mount automotive blade fuse clips engineered to secure fuses in place even after multiple insertions. Designed for high-density applications, the new compact and low profile fuse clips are available in vertical, horizontal and thru-board blade entry types. Key features of the new SMT automotive blade fuse clips: Accepts standard style ATO and ATC fuses, low profile Mini #891 or ATM-LP fuses and Mini and ATM series of Mini auto fuses Voltage rating at 500VAC and 15-30 Amps Brass construction with tin nickel plate Available in bulk or in tape and reel Ordering instruction: Vertical entry clips used with Mini, low profile or standard auto blade fuses: Cat. No. 3586 (bulk) or 3586 TR (tape & reel) Horizontal entry clips used with Mini auto blade fuses: Cat. No. 3569 (bulk) or 3569 TR (tape & reel) Low profile environment vertical entry clips using Mini auto fuses: Cat. No. 3563 (bulk) or 3563 TR (tape & reel) Keystone Electronics Corp. is a major manufacturer of interconnect components and hardware in addition to providing a full complement of stamping, machining and assembling services. Keystone is ISO-9001:2008 certified and RoHS, REACH compliant with headquarters in the USA, and offices in Canada, Europe, Australia and Asia. Keystone Electronics Corp. products are available in Australia from NPA. 10/08/11 - NPA presents Keystone Electronic Corp’s new line of Vertical Entry Lithium Coin Cell Holders, which are designed to retain cells securely under shock and vibration. These coin cell holders are ideal for portable medical applications and other electronic devices. The Vertical Entry Lithium Coin Cell Holders feature flame retardant housings UL rated 94V -0 and dual spring contacts with low contact resistant. The contacts are made from spring steel with tin plating. The Vertical Entry Lithium Coin Cell Holders are available in 16mm (Cat. No. 1069), 20mm (Cat. No. 1065 and 1067) and 24mm (Cat. No. 1068) diameter coin cell batteries. 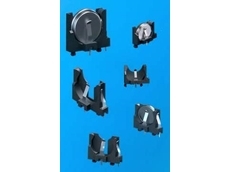 These coin cell holders are polarised for circuit protection and can accept all major manufacturers of batteries. Keystone Electronic Corp’s range of battery equipment and hardware are incorporated with SMT and THM products including contacts, clips, holders, retainers and straps for coin cells and cylindrical batteries. The Vertical Entry Lithium Coin Cell Holders are available from NPA.